Something fun to start today … Dan Lepard at The Guardian listed my White Chocolate Lime Cookies as one of the Highlights from the Blogs This Week!! See the mention here, and thank you to Dan Lepard!! 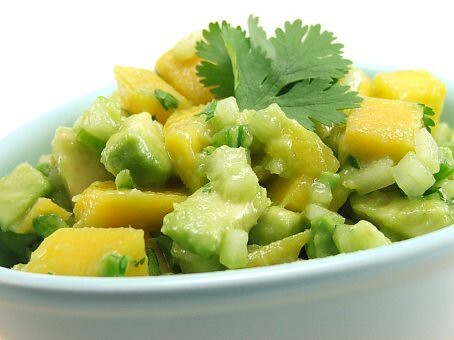 When I have steak tacos, and I am feeling summery, I make mango avocado salsa to go on top. I love the cool greens and bright yellow of this salsa. It puts me in the mood to relax, and the refreshing taste keeps me coming back for more. As a party dish, it is always very popular not only because it looks pretty but because it tastes so good. It is a simple salsa, but I love simple food. 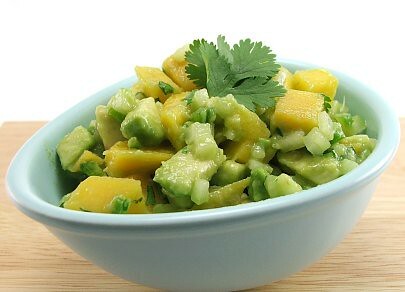 Mango avocado salsa makes a wonderful accompaniment to rich, spicy beef or grilled chicken. It is so good on crispy fish tacos I can’t even tell you, but it is just as lovely piled on on corn chips. It takes hardly any time to make, maybe five or ten minutes, and it lasts for a day or two in the fridge, but it is best eaten the day you make it. 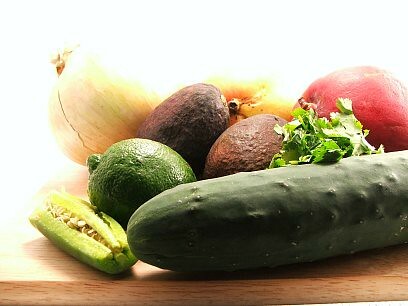 Make sure your mangoes and avocados are ripe, otherise it will not be as sweet and creamy. Combine all the ingredients. squeeze lime juice over, add salt and toss to mix. Chill for thirty minutes before serving.